Odesnik lost in the first round at Indian Wells and did not qualify for the Miami Masters. American player pleads guilty to importing human growth hormone into Australia. Wayne Odesnik was stopped by customs officials in January. The offence carries two-year ban under WADA code. 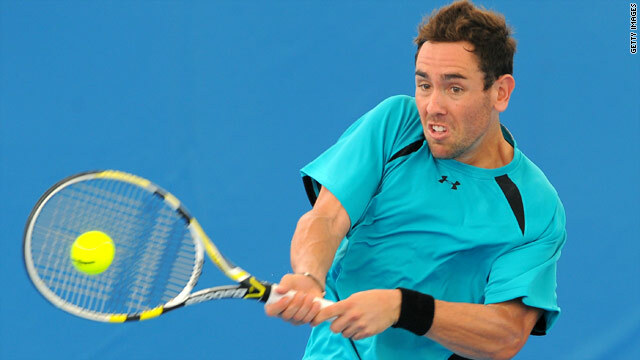 (CNN) -- American tennis player Wayne Odesnik is facing a two-year ban from the sport after pleading guilty to importing human growth hormone into Australia. Odesnik, ranked 98 in the world, was stopped by customs officers when he arrived in the country for the Brisbane International, ahead of the Australian Open in January. After submitting his guilty plea at Brisbane Magistrates Court, the 24-year-old was fined fined just over $8,000. "We are extremely disappointed in the behaviour of this individual, which is in no way representative of the sport of tennis," the Association of Tennis Professionals (ATP) said in a statement emailed to CNN. "We remain wholly committed to a clean sport for our players, tournaments and fans." Tennis complies with the World Anti-Doping Authority's code, which recommends a two-year ban for possession of prohibited substances. Odesnik failed to qualify for this week's Miami Masters after losing in the first round at Indian Wells earlier this month.